A large fruit with a waxy red outside and a white fleshed inside, spotted with small soft edible seeds. 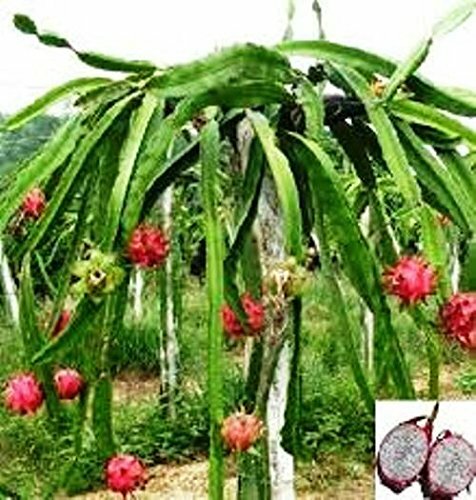 Dragon fruits are also known as pitaya and orchid cactus. Dragon fruit grows like a vine with a succulent with gorgeous, large, night blooming white flowers followed by vivid exotic fruit. Plant does extremely well in pots and is usually trellised. For those who can grow them outside, they are a useful addition ornamentally as well as nutritionally. Jaina is self-fertile, meaning it can fruit without a different variety. Space 8-10' apart on trellis, fence, or wall. Or grow in a pot in the greenhouse or indoors, moving the plant to larger containers as the plant grows. Outside zones are 9-11. The price includes Four (4) Dragon Fruit White 'Vietnamese Jaina' with USPS Priority Shipping. These are 2 inch rooted plants shipped in 2 inch tray pots and are 1-3 inches tall (currently smaller than normal). A large fruit with a waxy red outside and a white fleshed inside, spotted with small soft edible seeds. Dragon fruits are also known as pitaya and orchid cactus. Dragon fruit grows like a vine with a succulent with gorgeous, large, night blooming white flowers followed by vivid exotic fruit. Most all edible plants grow well in Full Sun, a little shade won't hurt. For starter plants I recommend growing in a 4 inch to 1 gallon pot to allow your plants to get a little bigger then then re-pot or plant. See Full Product Description and more information on how to grow below.